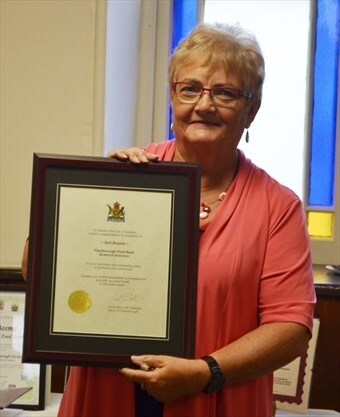 After 27 years at the helm of the Flamborough Food Bank, Gail Bosma is giving up the reins. Bosma, who lives in St. George with her husband Jake, thanked all the volunteers who she worked with over the years. Bosma noted when people come through the food bank’s doors many are shy and uncomfortable. Partridge added Bosma has also been involved in partnerships with other organizations, such as Drummond House and the Flamborough Women’s Resource Centre. 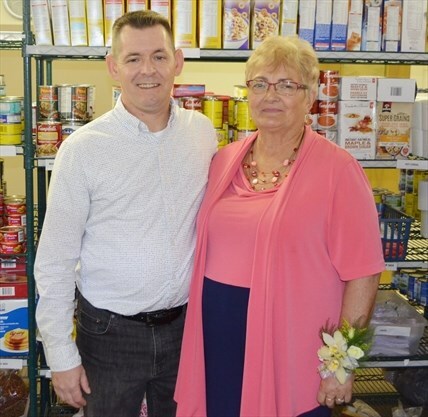 Retiring food bank board chairperson Susan Romano said the food bank came to be after the Carlisle United Church minister offered food from the church cupboard to a person in need. The idea of a food bank was put to the congregation and Gail jumped on board — and has been on board ever since. “Twenty years ago in their 1976 brown van, with some of the Bosma clan taking up valuable real estate inside, Jake and Gail picked up groceries, delivered, handed out turkeys — you name it, they did it,” Romano said. She noted the food bank has been involved in programs at local schools — including providing money for high school students to purchase lunches, as well as the popular backpack program. Romano added the Review would often provide coverage of the food bank’s activities and Bosma would request volunteers show up for photos — however, she received a lot of resistance. Romano joked that Bosma received a “salary” of 50 cents per hour — the average hourly wage in 1941. “Clearly, this was a labour of love for Gail,” she said. “I have personally seen Gail reach into her purse to loan cash to a client, worry about a family who had no heat and arrange for wood to be delivered to that house, arrive with warm clothes for a client, deliver groceries, ensure that a client whose windows were sealed got a fan. Romano added the Flamborough Food Bank also conscripted a small army behind Gail — the Bosma family. She noted the Bosma’s four children have been involved in everything from collecting donations at the Rockton Fair to computer assistance. Bosma also thanked her family for their tireless support over the years. “Most of the time they got dragged into helping out because I couldn’t find anyone else to do it,” she said. She added it was time to pass the reins to the new managing director, Jim Leamen. “It’s time to let go and hand over the job,” she said, noting Leamen is great with the clients and volunteers and has a lot of administrative experience. In an interview, Bosma said it was fabulous to be feted with the retirement celebration. Bosma said even though she stepped away from the food bank earlier this fall, she’s not used to the change yet. Bosma admitted she isn’t sure what she’ll do with her time. “Probably by January or February I’ll be bored out of my mind and want to come back,” she said with a laugh. Bosma said she got involved with the food bank and stayed involved for so many years because of her love for the clients. “I just love the clients — that’s the part that I’ll miss the most — just relating to people who need a smile, a hug,” she said. “You take them into the office, they can have a good cry.